The genome editor CRISPR has transformed many areas of biology, but using this tool to enhance certain varieties of crops such as wheat and corn remains difficult because of the plants’ tough cell walls. Now, a major agricultural company has creatively solved that problem by using pollen from one genetically modified plant to carry CRISPR’s components into another plant’s cells. The solution promises to speed the creation of better and more versatile crops, scientists say. CRISPR consists of enzymatic scissors called Cas9 that a guide made from RNA shuttles to an exact place in a genome. Because plant cells have an extra-rigid wall compared with animal cells, it’s more difficult for CRISPR’s Cas9 and the guide RNA (gRNA) to reach their genomes and make edits. So researchers have had to splice those CRISPR genes into a bacterium that can breach the plant cell wall or put them on gold particles and shoot them in with what’s known as a gene gun. Not only is this inelegant, it also doesn’t work in many plant species, including important crop varieties. A team of researchers led by plant biologists Timothy Kelliher and Qiudeng Que of Syngenta in Durham, North Carolina, fashioned a way around this problem by exploiting an odd phenomenon known as haploid induction, which allows pollen to fertilize plants without permanently transferring “male” genetic material to offspring. The newly created plants only have a female set of chromosomes—making them haploid instead of the traditional diploid. Haploid induction by itself can lead to increased breeding efficiency and higher yielding plants. 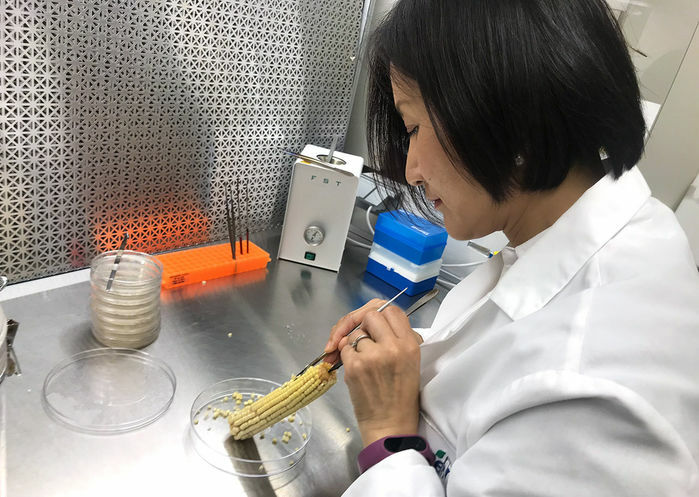 Syngenta initially took advantage of a corn line that can be transformed with CRISPR with relative ease using the bacteria or gene gun technology, and that has a crippled version of a gene, MATRILINEAL, making its pollen able to trigger haploid induction. The researchers transformed this corn line with a gRNA/Cas9 combinations programmed to target genes related to different desirable traits. The pollen of these transformed plants could then spread the gRNA and Cas9 editing machinery to other corn varieties that had been recalcitrant to CRISPR. “The key innovation is using haploid inducer pollen as a sort of Trojan Horse,” says Kelliher, whose Syngenta-led team describes the system today in Nature Biotechnology . There is also some evidence, they say, that the CRISPR-carrying corn pollen can edit the DNA of wheat. The researchers further devised a second CRISPR system for Arabidopsis, a genus of plants related to cabbage, broccoli, kale, and cauliflower. This haploid induction-edit (HI-edit), as Syngenta calls the CRISPR pollen method, has only been done so far in laboratories. But scientists say that if it were done in the field, the changes wouldn’t spread because the male genome in the pollen—which carries the CRISPR apparatus—disappears shortly after fertilization. “The CRISPR machinery gets lost—it’s transient delivery,” Que says. And because the method doesn’t involve putting the CRISPR genes into the DNA of the resulting crops, they likely wouldn’t qualify as genetically modified under current U.S. regulations, making it easier to obtain regulatory approval for selling the crops. Gao notes there are other ways to improve CRISPR’s success in recalcitrant plants, including a technology described 2 years ago by DuPont Pioneer researchers that overexpresses two genes that affect early embryo development. “So [HI-edit] is not the only solution, but it’s a smart one,” Gao says.